Dynafit historians rejoice. The new Speed Turn is an amalgamation of the classic TLT Speed and the soon-to-be-classic Speed Radical bindings. 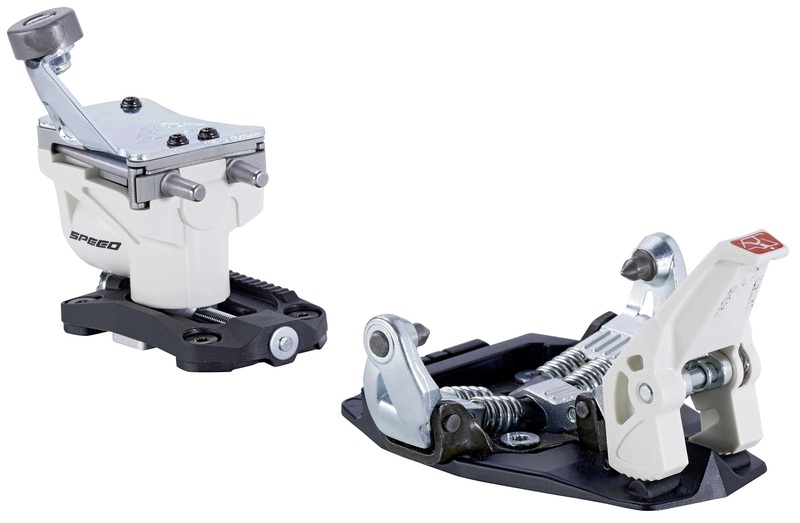 With an old-school Speed-style climbing bar affixed atop a modern Radical housing, the heel pieces have three climbing positions and a full 25 millimeters of adjustability to accommodate multiple boots. If you’re not a fan of the flap-style risers and yearn for a simpler rotational design, the Speed Turn could be for you. The toe pieces are of classic 5-hole design, with the minimalist metal front plate supported by a plastic mounting base. The toes feature both skiing and locked-out skinning modes along with a crampon receptor for those icy spring mornings. This is the classic design that can still be seen going strong on 10+ year-old skis of backcountry stalwarts. Classic climbing bar with plastic nubbin offers 2 riser positions along with a flat-on-ski mode. Radical heel base has 12.5mm of fore/aft adjustment, much more than the TLT Speed’s 3mm. Locked uphill and unlocked downhill modes on the toe provide a balance of safety and security. Crampon slot molded into the plastic baseplate lets you affix Dynafit style ski crampons. Separate lateral and vertical release adjustments scale between 4 and 10 independently. Comes with a Guide Leash so you can opt to not lose a ski down the mountain. Weighing approximately the same, the Speed Turn and Radical primarily differ in the riser mechanisms, operation of which is a personal preference. To change riser heights with the Speed Turn, you need to rotate the heel piece in either direction versus flipping the risers into place as with the Radical. The Turn is also missing the Power Towers on the toe pieces, which can make stepping in a touch harder. The simpler design will save you $50, however. Hi Pierre, it is not unusual for 10 year old bindings (tech or alpine) to fail catastrophically. The Speed Turn heel is similar in function to the Comfort (sans brakes) and could be used as a replacement. Pin height is slightly different so ideally you would replace both. Heels are found here. Is it possible to replace the climbing bar on the speed turn 2.0, with the step climbing bars from a speed radical? If so, do have that part in stock? Hey Nicholas, thanks for reaching out. Not really, mostly because the roof for the Speed Radical isn't available separately. There are, however, a few aftermarket options for you, but none that will give you the highest riser option, only the middle height, flat mode, and ski mode. The Maruelli Click-Clack riser is an aftermarket upgrade option that is pretty sweet and has a spring loaded riser so it's easy to flip with a pole. Plus it looks sweet. B&D also makes a roof / plate that just screws onto the top, minimizing weight and optimizing simplicity, but it is designed to act more as a replacement rather than an aftermarket upgrade and you lose the max riser height. They are light, they are simple, they are elegant. But they are tricky little buggers to turn! I am one of those terminally retarded folks who can't figure out how to turn them with a ski pole. I can make all the turns except the final turn into ski mode, at that point the pole gets stuck. Sigh. They also have the fundamental Dynafit hangup: there is no way to release the heel, you must release the toe, exit the binding, turn the heel, then click the toe back in. While you're fiddling with that your buddies on telly gear are 100 yards down the trail. Hi Emmie, they should work fine, but have them tested before use to make sure the inserts are in working order. Do you have any tips for turning the heel without unclipping your toe? Is it just trying to get your pole tip in there and torque on it? This seems to be pretty hard to do. Do you happen know if there are any videos out there of someone who does this well? I think the problem I'm having is when reaching down the heel is too hard to turn. I'm envisioning this to be even harder in a skimo race when I need to do it 10+ times in a race. Is the difficulty in turning the heel due to the DIN setting? If the din is lower would that make it is easier to turn? And is it ok to turn it in either direction or only clockwise? Hi Spindogg, the Speed Turn isn't ideal for racing; a binding with simple heel flaps is faster. And yes there is a relationship between the release value setting and the force required to turn the heel. You can rotate them either direction. How does the heel unit compare to the Speed Classic in terms of pin height and length? I seem to remember that the speed classic has slightly shorter heel pins than the radical series, and those heel pins are also lower to the ski than say the speed radical resulting in a lower delta. Is the speed turn identical to the old heel unit in these ways? Hi Josh, the heel pins are a few mm higher and a couple mm longer in this version vs the TLT Classic. Hi: I was under the impression that Dynafit has launched a super simple binding like this one but with a brake option. Is that correct? Also, does this binding have a slot for a crampon or how would I use a crampon with this binding? Thanks! Hi Alex, you might be thinking of the Superlite 2.0, which is stripped of fully adjustable release and flat-on-ski modes. Yes the Speed Turn (and the Superlite) have crampon attachments. Curious if these will work with a Salomon Quest Pro TR110 2014/15 boot with toe plates? I'm new to this AT game, but like to downhill also and can't spend mucho money for many boots :)Thank you! Hi Kurt, those boots have tech fittings so there shouldn't be a problem. will these work with BD Factor 130s? Hi Lace, unfortunately not. These require tech fitting in the boot soles. I want to use these bindings on a split board. I wonder if they will fit between the pucks mounted on the board for the down hill binding. Is there a spec sheet or something I can look at to see if they will work with my set-up? Hi Michael, I wasn't able to get a design doc, but here is a crude trace. I run the toe pieces on my split with great success. I don't think you'll have room for the heels between the pucks unless your feet are tiny or your stance is super wide, or both. This is a great price. And as someone who has had problems with the rad heel (cracked top piece), I can appreciate the simpler design of the heel. But I wonder about the durability of the toe for someone my weight (200 lbs.). My questions is whether or not people my size are reporting any issues with prerelease on these toes? I know the power tower makes it easier to step in, but it also seems to hold the boot in better? Is this accurate? Hi Chris, this is the same toe piece that was on the Vertical series that folks of all sizes used. In theory there is some pre-release benefit to the Power Towers but it is hard to measure conclusively. What is the ramp on the Speed Turn? Hi Spencer, the actual ramp angle depends on the length of your boots. The pin height delta is about 15mm, the same as the Radical bindings. I initially bought these bindings as an inexpensive entry into the tech binding scene. I went with these over the radicals because I usually espouse a "simpler is better" philosophy when it comes to gear. After a year on these I've enjoyed them enough to consider buying a second pair to mount on another pair of skis. These are just a simple, solid binding. They do what you expect them to do with no surprises. There's something to be said for a design that hasn't significantly changed in a while. I find that I can turn the heel with a ski tip most of the time, but if I'm not wearing a heavy pack it's usually quicker to turn them by hand. I am not an aggressive skier and have not taken any big falls on these so I can't particularly speak to their release characteristics, except that I have fairly moderate release values dialed in and have never pre-released. For reference these are mounted on BD Carbon Converts and skied with Spectres. The included leashes are a high quality bonus. If I could change one thing it would be a metal base plate and crampon slot under the toe. Seems like a weak spot, although I haven't had any issues so far. To sum it up, I've been very happy with the purchase and wouldn't hesitate to buy them again. This looks like a nice price on these Dynafit speed turns....do you know what year they are from (2013/2014) and if older, are their any real differences to the 2015 or more recent models? Hi Matt, the remaining stock is from 2014/15. They are functionally equivalent to the 2015/16 version, known as the Speed Turn 2.0. For the new version, Dynafit changed the toe piece to the Radical design which is a 4-hole screw pattern without a base plate. This one has 5 screws in the toe, but it works the same. I would like to get a brake for this binding. It will be mounted on Elan Himalaya touring skis, 177s, 97mm under foot, I believe. What is your recommendation? Hi Mike, the only brake that I know would work is the Kreuzspitze. It slides into the crampon slot. Check out the Radical ST for an integrated brake. Is it possible to change between heel riser levels with a ski pole or do you need to bend down and twist? Hi Jack, you can get some poles tips into the climbing aid hole and turn it at some angles, but it's more reliable to just turn this one by hand. Thanks for answering that last question. Here's one more: do you know what the screw lengths/types are for this binding? I usually install inserts with machine screws so trying to figure out if they are totally different are similar to say the old TLT speed. Hi Cameron, they are the standard 12.5mm Torx screws. Same length as the old TLT Speed. The Speed Radical fasteners will work. Wondering if the Speed Turn shares the same mounting pattern as a 2010 Vertical ST? Hi Cameron, it sure does. Check out our table of mounting patterns for more info. The speed turns are an awesome binding. I was originally hesitant to go to the radical due to the heel, but have found the speed turn heel to perform amazingly well. Just wish someone sold a radical toe with speed turn heel, as swapping the radical toe makes for the ultimate BC binding on almost all planks. this year's model of speed turns provide exactly what you're looking for. I'm just wondering though what the difference in toe pieces is? Which, if any, of these models has the Power towers? and is that even significant?